It was the School Valedictorian versus the School Starting Quarterback. It was the Activist Progressive Left of Center Democrat versus the Pro Business Progressive Centrist Democrat. It was the November Mayoral Frontrunner Kate Gallego versus the November second place winner Daniel Valenzuela. 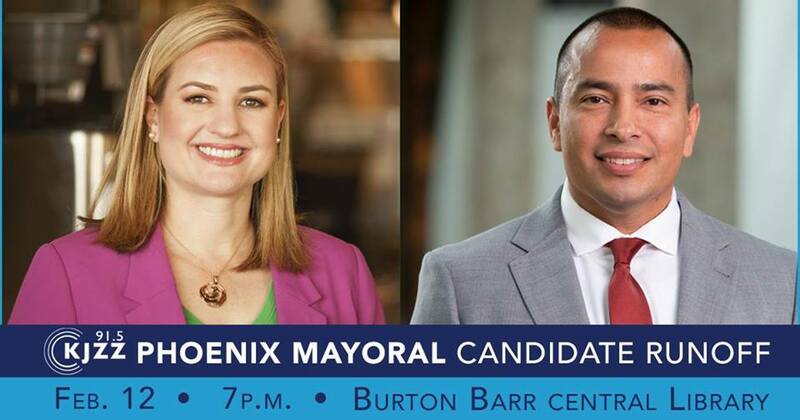 On the eve of the release of early voting ballots with a month to go until the March 12 Mayoral runoff election, former councilmembers Kate Gallego and Daniel Valenzuela met at the KJZZ sponsored mayoral forum at the Burton Barr Public Library in Phoenix. At the end of the hour-long event, it was clear that former Councilmember Gallego had bested Mr. Valenzuela on the substance and presentation of the issues that were discussed. Why is there a runoff election on March 12, 2019, for Phoenix Mayor? Two very well qualified progressive-minded Democrats are running for Mayor of Phoenix in a March 12, 2019 runoff election. Why is there a runoff election? There is a runoff election on March 12, 2019, because Ms. Gallego did not receive at least 50 percent plus one of the vote in the November elections. She received 45 percent while Mr. Valenzuela received 26 percent for second place. The other major candidates Moses Sanchez and Nicholas Sarwark came in third and fourth place with the remainder of the vote and were eliminated from the runoff. The frontrunner going into the runoff, Ms. Gallego, with new members to her campaign team, has continued speaking on the positive progressive themes she ran on that nearly propelled her to a 50 percent plus one victory in November. Mr. Valenzuela has also continued to emphasize the progressive themes he has run on with a more right-leaning tilt (especially on promoting business development and public safety) now that he has a new campaign team of mostly McCain staffers. This strategy is an apparent attempt to attract Republican supporters that are looking for a more moderate candidate to support. This strategy, which has already resulted in condemnation for its misleading advertisements on Councilperson Gallego’s positions on funding public safety, may prove counterproductive as this potentially results in more Democrats flocking to her campaign rather than supporting his. Why Councilmember Gallego won on the issues and presentation? The candidates took questions on a wide array of issues such as the plight of the homelessness, city budgeting, affordable housing, light rail, climate change, water conservation, utility rate hikes, the Talking Stick Arena Renovation Price tag, infrastructure, and government transparency. Both of their top three issues were jobs, public safety (although Valenzuela had these two in reverse order) and infrastructure. With the exception of the renovations for Talking Sticks Arena (She wants the Suns to pay for it all. He supported the Council plan for the city to pay for most of them), affordable housing (Mr. Valenzuela thinks we need more) and Mr. Valenzuela’s alluding that he is the stronger on promoting public safety, most of the candidates responses were mostly similar in what they would offer. Both supported the expansion of light rail. Both wanted to maintain and expand our infrastructure on roads, water supply and storage, Sky Harbor Airport, and Green Technology. Both wanted to help the homelessness get off the street through job training, housing assistance, and opioid treatment. Both wanted to recruit and augment the city staffs with talented individuals, especially in public safety (Ms. Gallego paid special attention to cybersecurity) and technology. However, it was clear after the opening statements that Ms. Gallego was better prepared and energized on substance and style for the evening’s forum. Like a political Hermione Granger, she consistently gave greater in-depth responses to the questions posed by the KJZZ moderators than Mr. Valenzuela showcasing her “wonky” mastery of the issues. She was also able to maintain a vibrant enthusiasm from the beginning to the end of the event. She, more than he, emphasized that she would focus on long-range innovative considerations when designing policy. She also successfully rebuked the erroneous claims of a Valenzuela supporting group with regards to her record on funding public safety. While Valenzuela clearly knew the issues as well as Ms. Gallego and, in some cases, his responses were more eloquent and relatable like his and his families experience living in a homeless shelter (although he gave that response when the topic of the state of the cities roads was being discussed) and his passionate belief in forging enduring ties with business and the public safety sectors, most of his other responses were not as detailed and at times, his lack of enthusiasm seemed to convey that he did not want to be there when discussing topics that were not related to business or public safety. There is a month to go before the March 12 runoff election. Whoever emerges victorious will probably serve the residents of Phoenix well as their next Mayor and move the city progressively forward. Based on their performances at the forum and the recent tactics the Valenzuela team has resorted to in distorting Ms. Gallego’s record on public safety, voters could reasonably conclude that she is better prepared on the issues and temperament to lead the Phoenix for the next four years. For more information on where Councilmembers Gallego and Valenzuela stand on the issues, please read the below links to the profile this writer composed for Blog for Arizona that was re-released in January. To listen to the actual forum, please click on the kjzz.org link below.